FINALLY.... I've updated my site AND got married!!! Well, I really don't have an excuse for not updating my site for a year except that in just under a year, I've been on two episodes of Family Feud, planned a wedding, started a new job and finally got married!!!! It's probably been one of the most exciting times in my life but also one of the craziest! I've done so many cakes in between and have to admit, I've not been the best at taking pictures of them all. If you have a picture of a cake I've done for you that's not on the site, feel free to share!!! My grandmother (a big Steve Harvey fan) begged me to send in an audition email. I sent in a video and we were picked to audition and then picked to be on the actual show!!! We were on two episodes and won the first episode!!!! I know it sounds cliche but it was such a bonding experience with my family and would have been totally worth it if we didn't end up coming home with any money! Second Update- My Wedding Shower! Yes, I made my own cake- the funny part is that I had NO IDEA that the cake was actually for me!! A friend of our family 'ordered' a cake for her daughter-in-law's 30th birthday. She gave me the creative freedom to design it however I wanted. 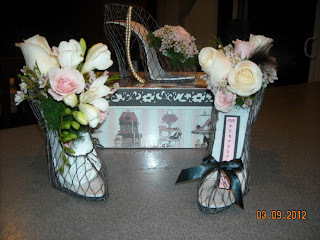 The theme was shoes and she gave me a box that had the colors and the theme of what she was going for (see the centerpieces below). 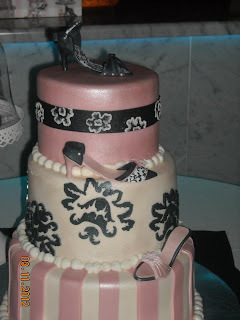 Well, I threw myself into the design and hand sculpted gumpaste shoes to go along the entire cake. I even delivered the cake...to my own shower!!! 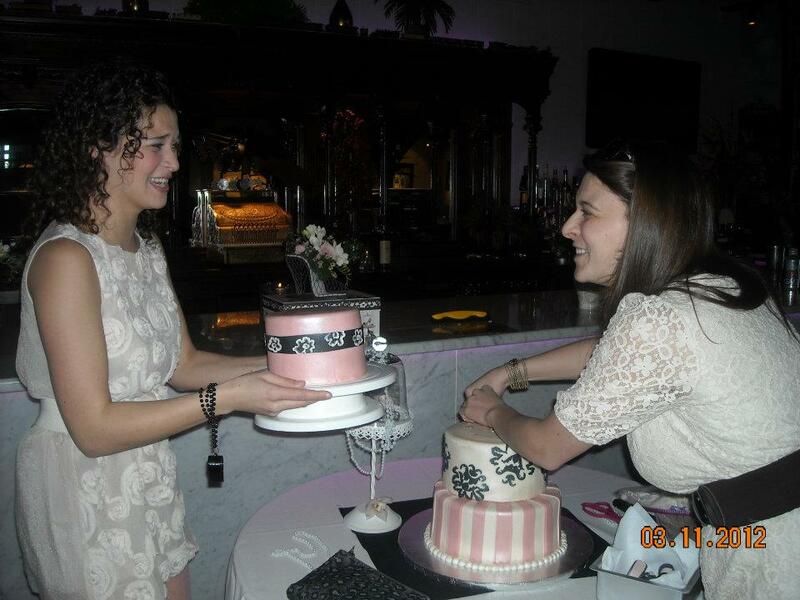 When I walked in, the cake was in separate tiers- 3 of them- because I had to drive from Boston to Worcester with it in my car. Needless to say, when they yelled "surprise" I nearly dropped the cake! Luckily our family friend and Dana were in on it and helped me out! I'll never forget my mom and mother in law running up to help and them saying "someone grab the cake quick"! I had to assemble it in front of everyone- with shaky hands!! Love this picture of me and my sis ! Love her and all of her hard work she put in to making this day so amazing!!! There are no words to describe what an amazing time I had with my family and friends on our day. I can't even possibly begin to describe all of the events that led up to our wedding day. There were a ton of do-it-yourself elements (more than I could ever list). Some of the major projects were- homemade cookies baked by my mom, aunt, grandmother and friends of our family for our Cookie Bar, ALL flowers done by my mother-in-law (which took over 24 hours- almost straight) and last but not least... MY CAKE- Yes, I was crazy enough to do my own but when Dana and I were looking for cake ideas there was no way I was going to be able to let someone else do it for me! I knew exactly what we wanted and just visualized this from day one. I also was able to surprise Dana (he admits it's the first time in 8 years I've ever truly surprised him) with a replica of his beloved Mustang. I wish I could post the video of him seeing it for the first time. If I can figure out how to, I definitely will! I had to make the cake a week before and sneak out of my house with all of my cake supplies so that my mother in law and I could decorate it at my bridesmaid's house! *I know my mother and mother-in-law would be in these pictures helping out if there weren't a million other things to get done. Dianne worked on the flowers for hours and my mom was the best organizer and host I could have ever asked for. Last but certainly not least for the 'adult cakes' is for one of my favorite guys in the whole world- MY DAD. I need to preface this cake by saying that there was a clip on our episode of Family Feud where my dad was had to answer "Name something you shouldn't do naked". Well, his first reaction was to say "Skydive". And then in another part of one of the shows, he mentions a tiara. So.... I made him a naked sky diver wearing a tiara. LOVE YOU & YOUR SENSE OF HUMOR, DAD!!!! Cupcake & Cake Combos- I LOVE doing these!! !